Unlike the Revlon Lip Butters the L'Oreal Caresse Lipsticks give you a nice 'wash' of colour across the lips as opposed to a full on colour. It's good for days when your at home or not doing much and just want a quick, effortlessly pop of colour. Admittedly I gravitate to lipsticks and love a matt finish to my lips, I've never ever been into 'glossy' finish products but I've quickly fallen in love with the Caresse Lipsticks and I will definitely be exploring the other colour's within the range. My experience of the Lip Butters was that they had quite a sticky formulation and a mirror was essential for application, you had to work a lot more with the colour but it did leave a nice stain of colour as it wore off during the day. 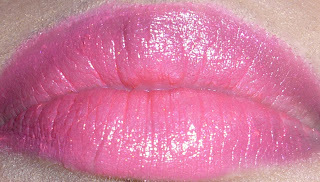 Top swatch: Revlon Lip Butter is Rapsberry Pie. 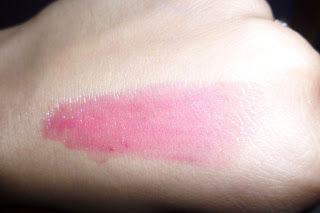 Bottom swatch: L'Oreal Caresse Lipstick in Aphrodite Scarlet. The Caresse Lipsticks on the other hand are totally opposite, you can effortlessly apply the colour without a mirror and the formulation is more of a tinted lip balm so it instantly gives your lips moisture and hydration however I do feel that they can sometimes feel a little bit greasy... but that maybe because I'm not use to the texture? The packaging of the Caresse Lipstick's is 100% better than the Revlon Lip Butters. I feel the packaging of the Lip Butters are a cheap imitation of the Chanel 'quilted' pattern...does anyone else agree ? In all honesty though if the product is good I can always forgive the packaging. Both products are the same price at £7.99 but I would much prefer to spend my £7.99 on the Caresse Lipsticks. I feel I wasted money on my Revlon Lip Butter but thankfully I didn't go mad and buy all the shades !!! I highly recommend the Caress Lipsticks and definitely favor them over the Lip Butters . Lip Butters or Caresse Lipsticks ? Thank you hun. 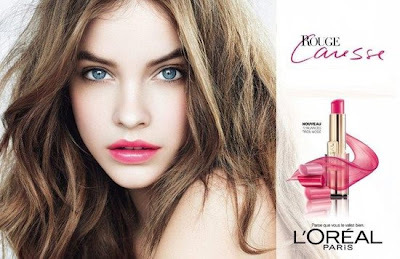 Have you tried the Caresse lipsticks?